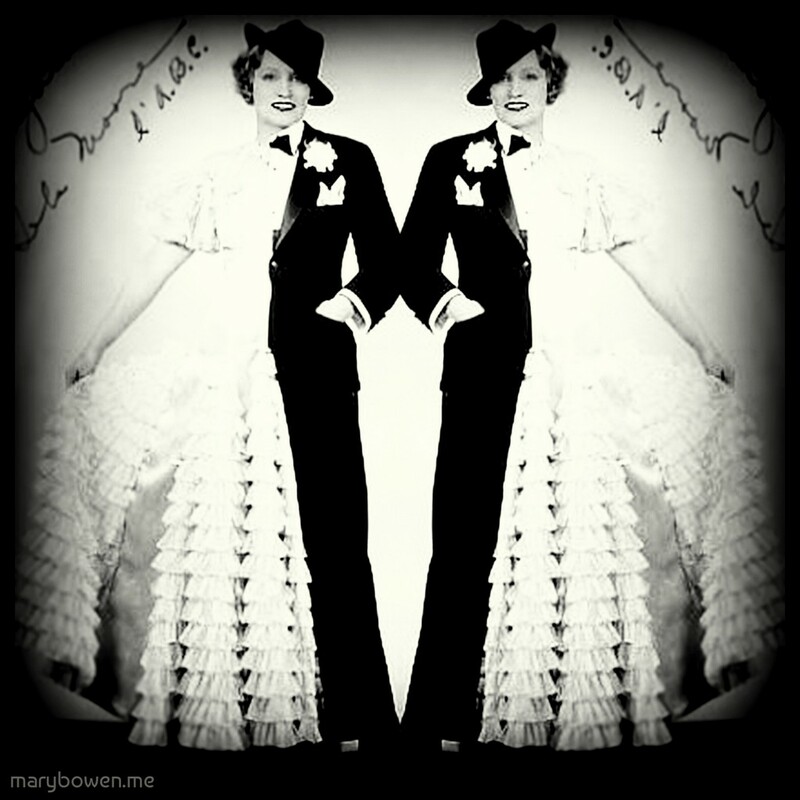 Standing in Two Worlds: Collage by Mary Bowen, using vintage photo from Tumblr. Today I’d like to talk a little about gender-fluid writers but right off the bat I have to say that I’m borrowing the term gender-fluid to make a point about writing: I do not refer to writers who identify IRL as gender-fluid, but rather I mean writers fluid enough in their emotional and intellectual skill-set to effectively and believably write from the POV of someone with a gender not their own. I realize I could be opening up a can of worms here, as some folks bristle at the very notion of male and female voices, or any kind of gendered categorizing or stereotyping for that matter. In response I can only say that as a writer, and as someone who has taught writing in both co-ed and uni-gender settings, I recognize a difference in communication styles between men and women by and large that is reflected both consciously and unconsciously in one’s writing. There are of course exceptions to the rule –some writers are more androgynous or gender-fluid than others, but I would argue that the cisgender male writer who really excels at giving voice to a cisgender female character, and vice versa, is rare. Note that I specified “cisgender” because I really cannot say if the ideas I’m mulling over can apply to writers who are trans or otherwise gender non-conformative/non-binary, but that is definitely an interesting topic worth pondering and writing about. I recently read the FANTASTIC memoir I’m Looking Through You: Growing Up Haunted by literature professor and trans-activist Jennifer Finney Boylan and in Ms. Boylan’s narrative nonfiction I definitely detect a blend of the classic male and female voices. To me it makes sense that as a writer she would unwittingly master a dual-voice; it reflects her experience as a woman who for years lived with a male body at odds with her inner self and the pains she took to conform to society’s expectations of masculinity. I encourage anyone with an interest to seek out trans writers to judge for themselves. I’ve enjoyed legions of female characters penned by men, but only twice in my reading life have I been so impressed with the authenticity of a female narrator that I found it hard to believe the author behind her was male. Those books were She’s Come Undone by Wally Lamb and How to be Good by Nick Hornby. I read She’s Come Undone in my late teens, an age when I was especially ripe to pick up on the angst of the young female narrator. I was blown away by how emotionally raw and true-to-life the main character adolescent Dolores Price is –who told him our secrets? Wally Lamb somehow managed to look inside the heart of female experience at its most confusing and fragile and I will forever take my hat off to him. Lamb’s She’s Come Undone remains for me the gold standard of gender-fluid writing. According to Lamb’s Wikipedia page, “He credits his ability to write in female voices, as well as male, with having grown up with older sisters in a neighborhood largely populated by girls.” In short, I can only surmise that Lamb’s achievement can be chocked up to these two essentials: keen powers of observation and sincere empathy. Hornby likewise has the beat on people and what makes them tick –the narrator of How to be Good Katie is a complex, conflicted, wholly realized and very funny woman. I must confess, however, that my praise for Hornby’s skill with female protagonists is born out of surprise that he has this skill at all. Nick Hornby has so successfully trafficked in the roundabouts of male romantic angst (most notably in High Fidelity and About a Boy) that it was a shock to discover his deep insight extended to the other side of the relationship coin. I can only say that like any good writer Hornby is always listening and observing. No way have I mastered the art of male narration/characterization. I struggle with making my males authentic and I suspect a lot of women do –largely because writing demands you get to the emotional guts of a character and in our society men are largely defined by the absence of emotion. I don’t think it is happenstance that many of the most successful and celebrated female crafters of male characters are writers of fantasy fiction and children/young adult fiction. From Anne Rice’s Lestat to J.K. Rowling’s Harry Potter to S.E. Hinton’s Pony Boy, fantasy and youth both provide gateways to worlds where it is permissible to explore the emotional lives of boys and men. I think the pitfall many female writers succumb to when writing males is to avoid any sort of emotional adornment, removing the proverbial skirt and hair bow from the stick figure as it were, and thus rendering the character too neutral. I’m still trying to muddle it all out but I suspect one should just keep returning to square one: OBSERVE! He & She: What say you? In conclusion, I hope I’ve introduced you to some new thoughts and some new books. I’d love to hear from folks in the comments section about what books you’ve read that are skillful examples of gender-fluid writing. What men have written really outstanding female characters? What women have mastered the masculine voice? I also welcome fellow writers to share how they approach writing as/about the opposite gender. As always, happy writing & reading! Posted in Reads for Writers, Technique and tagged Characterization, Gender, Narration. Bookmark the permalink. Hmmm. This is quite the thought provoking piece. I will honestly say that until this article, I haven’t quite thought about the writers ability to voice their characters fully as men or women. But, I have been disappointed from time to time with character’s that just didn’t sound authentic. There are several books I must re-read with this specific theme in mind starting with She’s Come Undone! That’s a good idea. Would love to know what you think about She’s Come Undone when you do. Thanks for commenting!